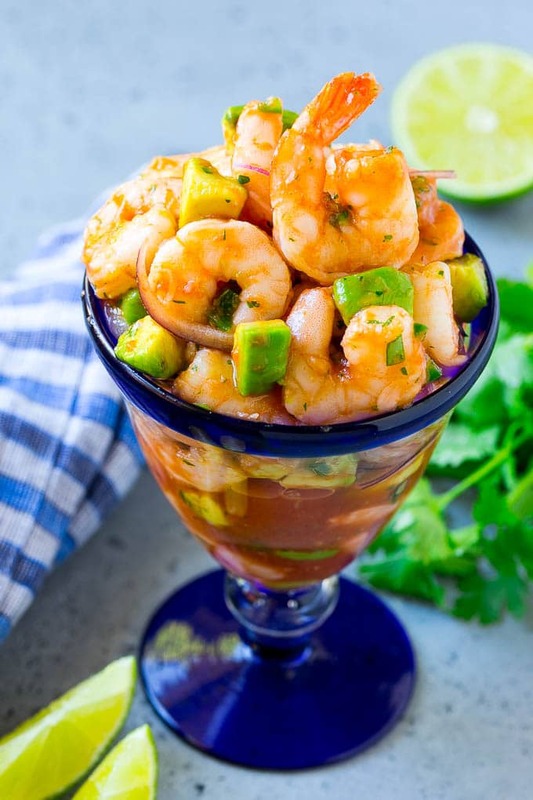 This recipe for Mexican shrimp cocktail (coctel de camarones) is fresh shrimp tossed in a homemade sauce with red onion, avocado, cilantro and jalapeno. It’s a light and refreshing appetizer that’s perfect for any party! Mexican shrimp cocktail is a great way to start off a Mexican themed meal. Try it alongside a Mexican caesar salad or carne asada tacos. Don’t forget the rice and beans to round out your dinner! I love a good shrimp cocktail, but they’re always crazy expensive at restaurants – $12 for 6 tiny shrimp with a little sauce?! I started making my own at home and now I never feel the urge to order them when eating out – shrimp cocktail is just so easy to make that I can whip it up any time I want in about 5 minutes. 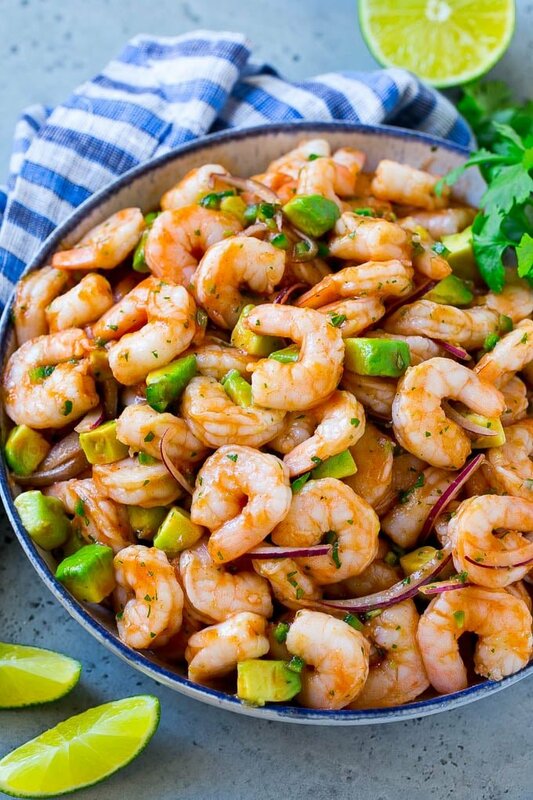 This mexican shrimp cocktail (also known as coctel de camarones) is a fun twist on the classic appetizer. How do you make Mexican shrimp cocktail? 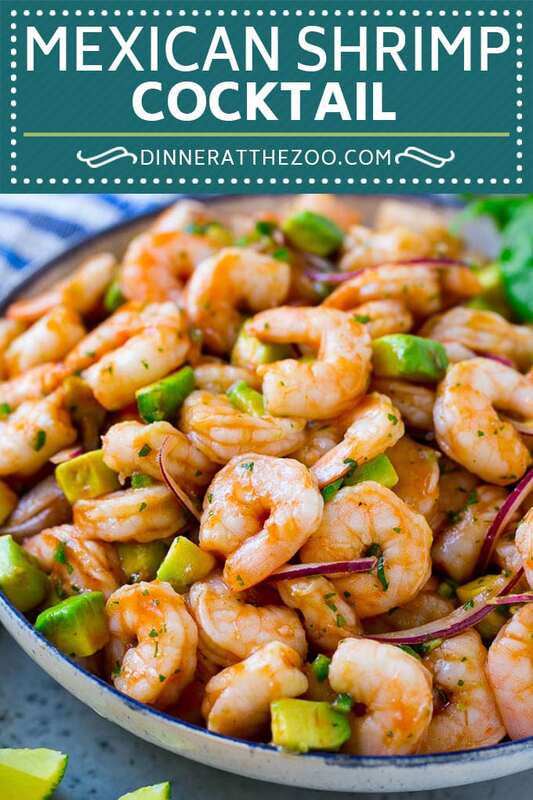 For this recipe, you’ll need shrimp, avocado, cilantro, red onion and jalapeno. I go with smaller shrimp here so that they’re bite sized, but feel free to use whatever sized shrimp you have on hand. I like to slice my red onion very thin with a mandoline for this recipe. The jalapeno adds a bit of a kick, but if you’re adverse to spicy food you can omit it altogether. If you remove the seeds and ribs from the jalapenos, the heat level of this dish will be quite mild. How do you make cocktail sauce? The sauce is a mixture of ketchup, tomato sauce, lime juice, orange juice and seasonings. 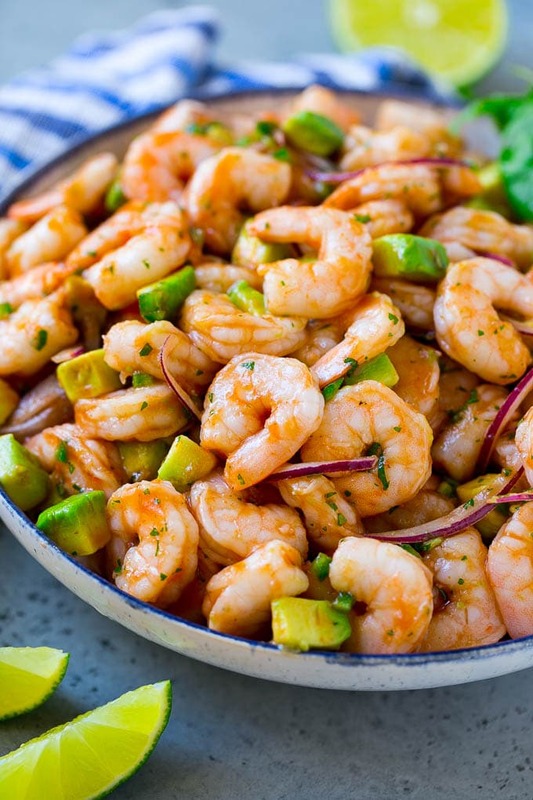 Simply pour the sauce over your shrimp, toss, and you’re ready to eat. This Mexican shrimp cocktail can be made up to 6 hours before you plan to serve it. If you’re planning to make it in advance, I’d recommend adding the avocado at the very end right before you serve so that it doesn’t turn brown. 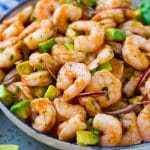 How do you cook shrimp for shrimp cocktail? I went the easy route here and purchased frozen pre-cooked shrimp which I thawed and patted dry. If you’re starting with raw shrimp, it’s very common to poach shrimp in boiling water. You can even saute or roast your shrimp if you prefer. I love that this Mexican shrimp cocktail is super easy to make, and when you dress it up a bit by putting it in some nice glasses with a few garnishes it transforms into an elegant appetizer that’s fit for any occasion. I can totally make a meal out of one of these with a side salad, and my kids even loved this shrimp cocktail! If that’s not a ringing endorsement I don’t know what is. You can eat this shrimp cocktail as is, or serve it with tortilla chips to scoop up your shrimp. You can also add more veggies into the mix such as diced cucumber or even red bell pepper. 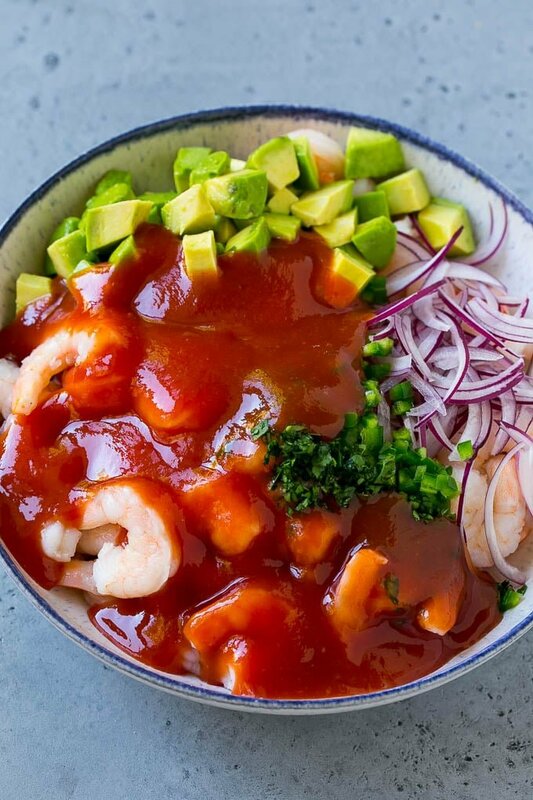 This recipe for Mexican shrimp cocktail (coctel de camarones) is fresh shrimp tossed in a homemade sauce with red onion, avocado, cilantro and jalapeno. It's a light and refreshing appetizer that's perfect for any party! 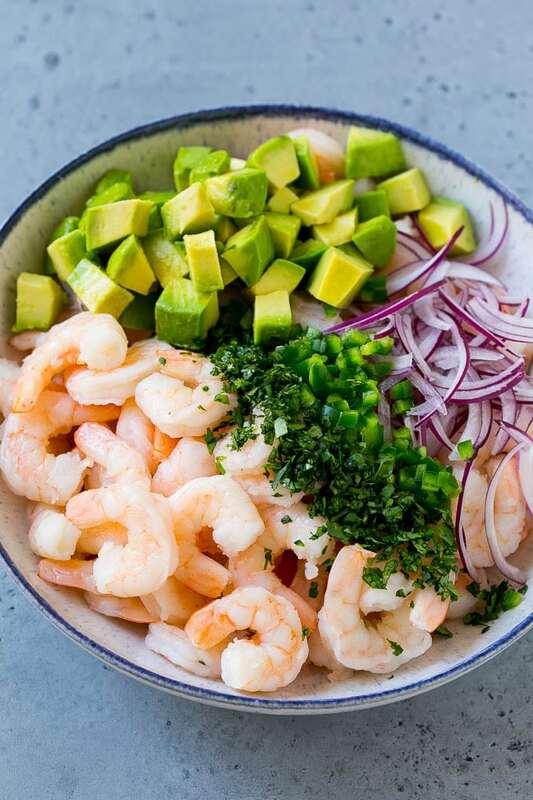 Place the shrimp, avocado, red onion, jalapeno and cilantro in a large bowl. In a small bowl, whisk together the lime juice, tomato sauce, ketchup, orange juice, salt and pepper. Pour the sauce over the shrimp and toss to coat evenly. Serve, garnished with lime wedges if desired. Make ahead directions: Follow the recipe as directed, but omit the avocado. Cover and refrigerate for up to 6 hours. Stir in the avocado right before serving. This post was originally published on February 4, 2016 and was updated on September 25, 2018 with new content. this is the mexican shrimp cocktail queen!! These look amazing!